L-R: RIA exports director Neil Walker, ARA CEO Danny Broad, ARA chair Bob Herbert, and RIA CEO Darren Caplan. Photo: RIA. 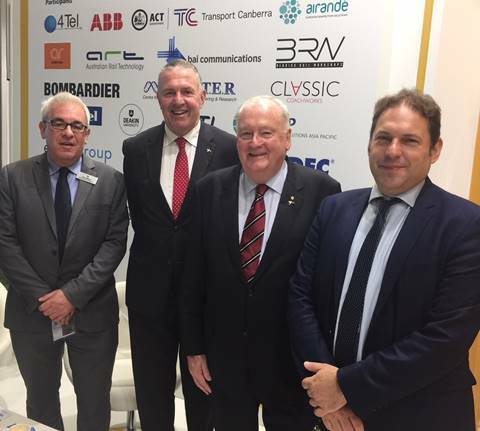 Members of the UK’s Railway Industry Association (RIA) and the Australasian Railway Association (ARA) are set to benefit from new opportunities born out of an agreement struck by the two organisations. In an announcement on September 18, the trade associations said they are forming a Memorandum of Understanding to promote a closer working relationship between the suppliers in each countries. RIA chief executive Darren Caplan described the pact as a “great example of an industry reaching out to fellow colleagues across the globe, to develop new trade links and cooperation”. He said this is particularly important as the UK prepares to leave the EU. The UK and Australia rail sectors face similar opportunities and challenges in the years ahead. Both are expected to see continued significant investment in rail but face issues recruiting new entrants into the rail industry, upskilling those already in the sector, smoothing out rail funding pipelines, and promoting the benefits of rail as a key driver of economic growth. ARA CEO Danny Broad added: “It’s an extremely exciting time to be in the rail industry in Australia and New Zealand with investment in new rail infrastructure and rolling stock over the next 15 years forecast to be around A$100 billion. Altogether RIA and ARA represent around 360 members, although some multinational rail firms are a part of both. The UK rail industry contributes £36 billion in economic growth each year and employs around 600,000, while in Australia alone, rail’s economic contributions is A$26 billion GDP, employing 140,000 workers, according to the associations.